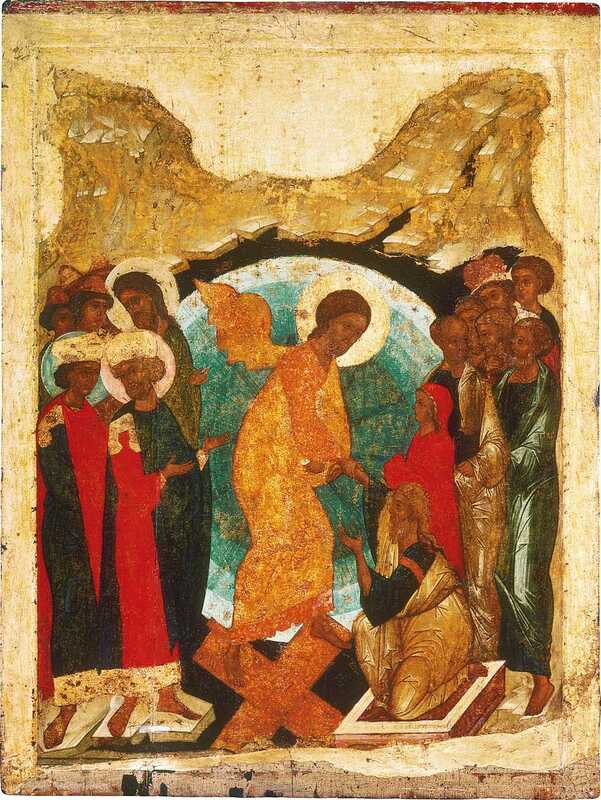 I greet you with the great and radiant Feast of Christ's Resurrection! In this radiant and all-joyous day the hearts of the faithful are filled with great happiness, there is joy in heaven and earth and in the entire universe. Why is that every time when we meet the feast of Pascha that our hearts are filled with a special and great joy! Because the resurrection of our Lord, Jesus Christ, clearly shows his Divinity, evidently proves all the dogmatic truths of our faith and is the foundation of the great deeds given to humanity by the Savior, is the foundation of our salvation and eternal life with Christ in the heavenly realm. The Lord conquered death, destroyed the gates of hell, trampled the power of the tormentors in hell and opened for us the doors of paradise. In this blessed day not only are the people glad and exult but also the Heavenly Hosts, the Holy Angels and Archangels, for the sake of the resurrected Christ, co-celebrate with us living on the earth: "The Angels in heaven, O Christ our Savior, sing thy Resurrection" (Matins stichera, tone 6). In the words of St. John Chrysostom, not only the angels and the myriad of heavenly hosts but also the Lord of the Angels, the Lord Jesus Christ exults and celebrates as the Holy Evangelist notes "with desire I have desired to eat this passover with you" (Luke 22, 15). The Lord, Himself, told us that He is "the way and truth and life" (John 14, 6). Therefore, so that our joy can be perfect we must follow the Truth, remain in the Truth bowing down to God "in spirit and truth" (John 4, 24). That is why, he who wishes to follow the Truth, who wants to be a true Christian, must try to kindle in himself a love for God and one's neighbor, must configure his heart to be humble and friendly. No one can be a true Christian if Christ does not live in him. Such a life originates from the heart and soul, from the internal spiritual make-up of the individual. Christ's Spirit must steer the Christian's life and conform it to Christ's image as the Holy Apostle Paul states about this: "For as many as are led by the Spirit of God, they are the Sons of God; now if any man have not the Spirit of Christ, he is none of His" (Rom. 8, 9, 14). Since whatever internal spirit guides an individual so he lives, righteously or sinfully, and it depends on the internal spiritual make-up of the individual. That is why the Venerable Seraphim of Sarov established that the purpose of a Christian life is the acquiring of the Holy Spirit. The Lord commanded us to ask to acquire the Holy Spirit and promised to give Him "to them that ask Him" (Luke 11, 13). "But if the Spirit of Him, says the Apostle, that raised up Jesus from the dead dwell in you, He that raised up Christ from the dead shall also quicken your mortal bodies by His Spirit that dwelleth in you" (Rom 8, 11); "if Christ be in you, the body is dead because of sin, but the Spirit is life because of righteousness" (Rom 8, 10). That is why an individual must first of all renew himself internally, discard the old sinful person and become as an image of Christ as the Holy Apostle Paul says: "and that ye put on the new man, which after God is created in righteousness and true holiness" (Ephes. 4, 24). Truth, as love, is essential in the task of our salvation and without it no one can achieve eternal life. One must stand for and defend the unadulterated confession and truth of the holy Christian faith from various schisms and heretics by the example of the Holy Fathers and teachers and by the example of the Ecumenical Councils. For the Christian, the Truth is more valuable than anything and for the witness of which the Savior came to earth as He said about it Himself to Pilate: "To this end I was born and for this cause came I into the world, that I would bear witness unto the truth. Every one that is of the truth heareth My voice" (John 18, 37). But, alas, in today's world the true faith, in all places, through the so-called "ecumenical" movement is exchanged via imaginary love to compromises in the faith, to the union with everyone, with various heretics, schismatics, and the heterodox on the basis of the unorthodox affirmation that the Church, supposedly, was divided into branches or fragments and that the union of all these erroneous teachings, supposedly, will form the unified Church body. This heresy of ecumenism, unfortunately, is followed by many who call themselves Orthodox. But by their works they can be easily identified. For example, in the past the Holy Fathers and Ecumenical Patriarchs fought against Catholicism, against the latin heresy, against the “filioque” and now we see how the principal sergianist "patriarch" greets and tenders a kiss to the chief Catholic. Even the Holy John the Theologian said with respect to those who do not follow the true teaching of Christ: "receive him not into your house neither bid him God speed; for he that biddeth him God speed is partaker of his evil deeds" (2 John 1, 10-11). Similarly, our all-Russian priest the Holy Righteous John of Kronstadt confessed that "the Catholics revile the Holy Spirit.” That is why such patriarchs sew deception when calling themselves Orthodox. People calling themselves Orthodox gather at so-called "All-Orthodox Councils" and as a basis are offered non-orthodox documents whose foundation is the idea of humanism, compromise in the faith and being lukewarm [to the faith]. It is clear that such gatherings of non-orthodox can only be called as meetings based on the all-heresy of ecumenism. It would be more exact and honest for the participants themselves to call such gatherings as "gatherings of the followers of Apostasy" and not delude unsophisticated people. There is no doubt that the Church wishes the "union of all.” But for the true Orthodox Christian there can be only one union, the union in Christ's Truth which, as its basis, has the pure faith unadulterated by heretical distortions and compromises. That is why, for a true Christian, all the calls to a “union," in which the Truth is mixed with lies can in no way be acceptable. The All-memorable Archbishop Averky (Taushev) very wisely warned about this: "the union that is presently being considered by the enemies of Christ's pure truth is not a union in Christ. This is a union that the Antichrist wishes to create for himself to subjugate all the people and to establish his kingdom. That is why we who wish to be proper Christians, relying on God's help, must always preserve our faith in the Truth, be faithful to the Orthodox confession of the faith, i.e. be faithful to our Christ the Savior. So that the Resurrected Christ, after the General resurrection, can address us sinners, but who preserved the faith commanded by the Lord: "thou good and faithful servant; thou hast been faithful over a few things...enter thou into the joy of thy Lord" (Matt. 25, 21). Since the Lord Himself commands us to maintain this faith even unto death: "be thou faithful unto death and I will give you a crown of life" (Apoc. 2, 10).